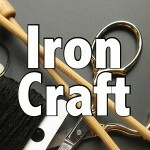 The challenge for the Iron Crafters this time around was to make something using supplies from a hardware store. 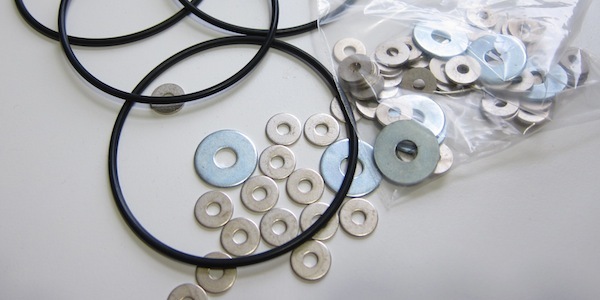 Here’s what I picked up, o-rings and washers. 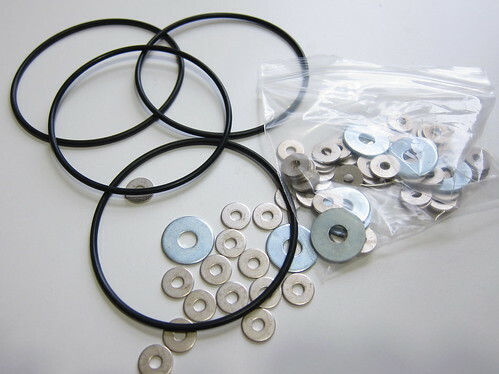 The o-rings are just those plastic bracelets we all used to wear up our arms in the 80’s (yikes, I’m dating myself). The washers were a steal at $0.79 a pound! I took those pieces and turned them into coasters. I added some cork and Mod Podge Dimensional from the craft store to pull it all together but the main items are those hardware store pieces. I’m not sure the Mod Podge was the way to go here, as is rusted the cheap washers a bit, but it gives a nice finish and seems to hold up to a damp glass so far. If I did this again I would use a plastic resin instead. 1. 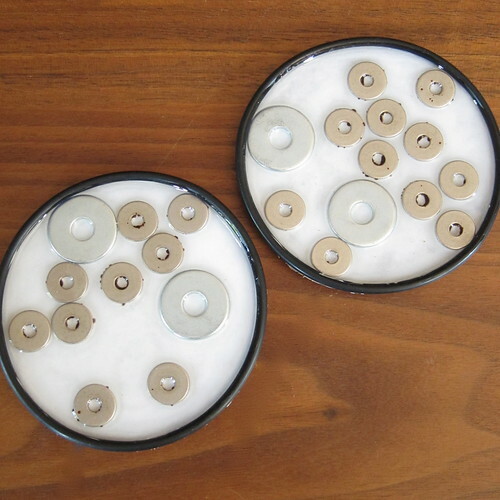 Use your compass to draw a circle on the cardstock the same size as your o-rings. It will look neatest when done if the cardstock fits inside the o-ring with none hanging out. 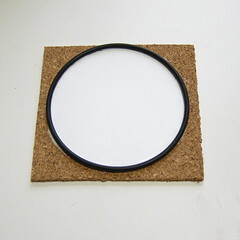 Cut out and glue the circle to the cork. 2. Glue the o-ring on top of the cardstock. 3. 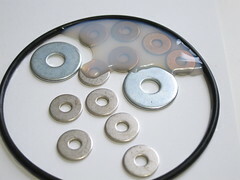 Place the washers inside the o-ring. 4. Fill with the Mod Podge or resin. If you get any bubbles a small paint brush can help get them out. Let dry at least over night. 5. Cut the coaster out using the exacto knife or scissors. Fun idea, and inexpensive. Thanks for the heads up on the rust problem. Resin might be the way to go. Or Dimensional Magic? ?